The Columbus Blue Jackets host the Carolina Hurricanes on Saturday for the second time this week. The Blue Jackets look to get back on track after suffering a 2-0 loss to the Senators on Thursday. The Hurricanes look to turn the page quickly after losing 7-1 on home ice to the Pittsburgh Penguins. Last time out, the Blue Jackets sent 42 shots to Mike Condon, only to have him stop them all. Kyle Turris and Ryan Dzingel each scored goals in support of Condon. Thursday marked just the third time the Blue Jackets went without scoring a goal. Sergei Bobrovsky earned third-star honors by stopping 26 of 28 shots. Also, both David Savard and Markus Nutivaara have undisclosed injuries. Expect Scott Harrington and Dalton Prout to play if either Savard or Nutivaara can’t go. Tortorella will disclose his starting goalie at 2:30 pm but don’t be surprised if Joonas Korpisalo gets the nod. 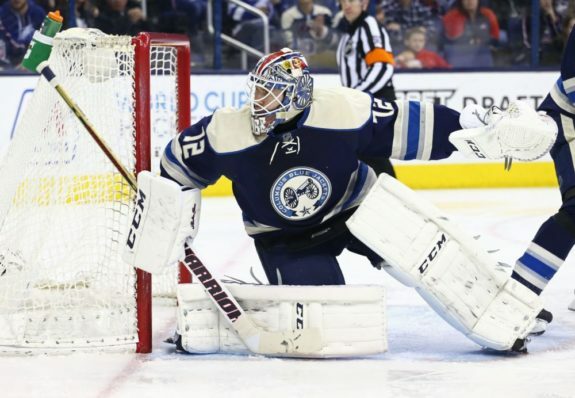 The Blue Jackets play in Ottawa Sunday and could choose to save Bobrovsky for that game. The Hurricanes couldn’t contain the defending champs Friday at home; they lost 7-1. Their only goal came in the third period from Viktor Stalberg while shorthanded. That made the score 6-1 at the time. Conor Sheary scored twice, while Justin Schultz, Evgeni Malkin and Phil Kessel had two points apiece. The Hurricanes recalled Michael Leighton from the AHL with the chance he might start this game. Coach Bill Peters confirmed after the Penguins’ game that he is leaning towards starting Leighton. Other than that, I would expect the same skaters for the Hurricanes. 1) The Blue Jackets enter Saturday as one of the best home teams in the NHL and they are 17-3-1 in their last 21 games at Nationwide Arena. In two of the three losses in that streak, the Blue Jackets were shut out, including in their last game, a 2-0 decision to the Ottawa Senators. The Blue Jackets defeated the Hurricanes 4-1 on Tuesday. 2) Blue Jackets goaltender Sergei Bobrovsky has allowed two goals or less in 75 percent of his starts this season (27 of 36). This has helped make the Blue Jackets an excellent closing team. They are 27-3-2 when tied or leading going into the third period. Bobrovsky is 27-7-2 on the season. 3) Hurricanes goaltender Cam Ward comes into Saturday starting 21 straight games, including Friday’s 7-1 loss to the Penguins. On the season, Ward is 18-13-6 with a 2.42 goals-against average and a .912 save percentage. Only Edmonton’s Cam Talbot has started more consecutive games this season. 4) The all-time series between the Blue Jackets and Hurricanes couldn’t be more even. Coming into Saturday’s game, the series stands at 13-13-2 overall, including Columbus going 6-6-1 at Nationwide Arena. They’re 7-7-1 in Carolina. The Hurricanes have points in five of their last seven trips to Columbus. The Blue Jackets need to continue generating chances like they did on Thursday against the Senators. They were able to get 42 shots on goal, although they didn’t score. As long as they continue to drive the net and forecheck, they should be able to take advantage of a Hurricanes team that played Friday. The Blue Jackets need to start with more urgency. The Hurricanes have now lost a couple in a row. They need to simplify their game, especially on the road less than 24 hours after the Penguins crushed them at home. Expect them to play a typical road game. However, if they’re not careful, this could get out of hand quickly. Their penalty kill needs to stay strong for them to stay in this game.